Roger Staubach is a name that strikes varying cords whenever it is mentioned in the media. From serving in Vietnam as a US Navy to enjoying a successful 11-season long career with the Dallas Cowboys of the NFL as a quarterback, working as a real estate broker during the off seasons, and establishing a highly successful company, The Staubach Company following his retirement, he has garnered all the credentials. A look at his career timeline shows besides the incredible stats, that he is a Heisman Trophy winner, Super Bowl MVP, was selected to six Pro Bowls, and inducted into the Pro Football Hall of Fame. Three decades after building his real estate company, he sold it to Jones Lang Lasalle for $613 million in 2008. Grab other fascinating deets about him below. Named Roger Thomas Staubach, the football icon was born on the 5th day of February 1942 in Cincinnati, Ohio, to Elizabeth (née Smyth) and Robert Staubach but grew up in Silverton on North Berkley Avenue. He has a partial German ancestry. Staubach attended St. John the Evangelist Catholic School and then graduated from Purcell High School (now Purcell Marian High School) in 1960. He spent the next year in New Mexico Military Institute in Roswell before proceeding to the U.S. Naval Academy in 1961 where he played quarterback for the Midshipmen. He won the Heisman Trophy in his junior year, becoming the last player from a military academy to win the trophy. The same year, he also clinched the Maxwell Award, the Walter Camp Memorial Trophy, and also led his team to the No. 2 ranking in the nation. Roger finished his career completing 292 of 463 passes with 18 touchdowns and 19 interceptions. In all, he garnered a school record of 4,253 yards of total offense. During his graduation in June 1965, the Academy retired his jersey number (12) and nearly two decades later (in 1981), he was inducted in the College Football Hall of Fame to mark his excellent career. Roger Staubach was commissioned directly into Supply Corps, the Academy’s first graduate to be commissioned directly, owing to detection of his color blindness in his junior year. A year after graduation, he volunteered for a tour of duty in Vietnam where he commanded 41 enlisted men. After he returned in 1967, he played football on various service teams to prep him for his future career in the National Football League while he completes his commission. He had been drafted prior, though as a future draft choice by the Dallas Cowboys in 1964 in the 10th round. He eventually joined the Cowboys in 1969 as a rookie. Nearly three decades after his service in the navy, Staubach was awarded the U.S. Navy Memorial Foundation’s Lone Sailor Award, this was in 1996. 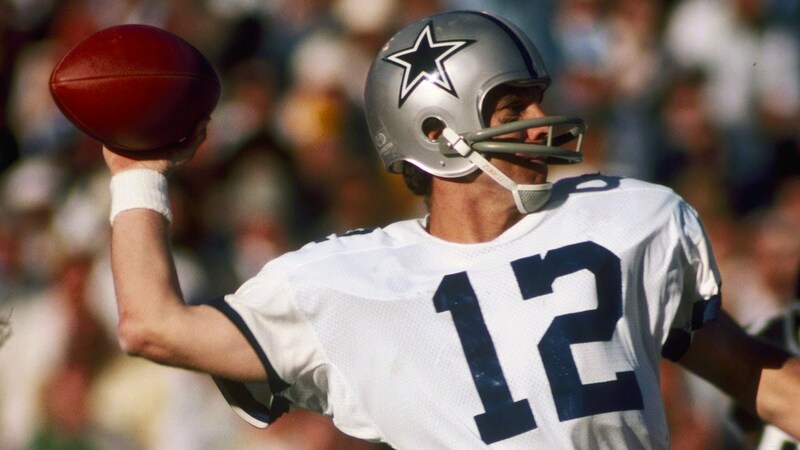 Staubach led the Dallas Cowboys to a pair of Super Bowl victories in five appearances; Super Bowl VI in 1972 and Super Bowl XII in 1977. Meanwhile, he won an MVP in the 1972 game, becoming the first of the four to win Heisman and Super Bowl MVP. Coming behind him are Jim Plunkett, Marcus Allen, and Desmond Howard. He was also a five-time All-NFC choice and earned an NFL MVP and six Pro Bowl selections (1971, 1975–1979). During his playing days, he earned a number of nicknames for his playing style and skills and was recognized as one of the most famous NFL players of the ’70s. He was called Roger The Dodger for his scrambling abilities, Captain America as quarterback of America’s Team, and for his fourth-quarter game-winning heroics, Captain Comeback was added to his repertoire. At the end of his pro career, Staubach compiled 1,685 completions for 22,700 yards and 153 touchdowns, with 109 interceptions. He also had 2,264 rushing yards and scored 21 touchdowns on 410 carries. Furthermore, he recorded the highest passer rating in the NFL through four seasons of his career (1971, 1973, 1978, 1979) and led the league with 23 TDs in 1973. Following a stellar career, Roger Staubach retired from gridiron in March 1980 and in his first year of eligibility five years later, was elected into the Pro Football Hall of Fame. In November 2018, the president of the United States, Donald Trump awarded him with the Presidential Medal of Freedom. Prior to Staubach playing in the NFL, he was a player in the real estate field. He worked with the Henry S. Miller Company as a broker during the off-season. It was a move to support his family as well as to have something to fall back on after he retires from sports, as football wasn’t as lucrative then as it is now. However, towards the end of his pro career, he founded his own real estate firm, the Staubach Company in 1977. It is directed toward helping corporations locate facilities such as office, retail, and industrial space. After 30 years of serving as the chairman and CEO of Staubach Company, he resigned on June 20, 2007. By 2008, the company had 68 offices, about 1,800 employees and has worked with major businesses such as AT&T and McDonald’s Corporation. It was also involved with residential development. Roger Staubach sold his company in July 2008 for $613 million to Jones Lang LaSalle, where he now serves as the Executive Chairman. Roger Staubach may not have made a fortune from his career as a sportsman but he is surely building an empire in his second career. Unlike most athletes who rely on their athletic acumen to make wealth, he has been able to make a larger amount of wealth as a businessman. His net worth is estimated at a whopping $600 million as at the time of this writing.